Fiscal Policy is a letter written by Arthur Conan Doyle first published in The Times on 31 october 1905. See also his second letter on the same topic: Fiscal Policy (7 november 1905). 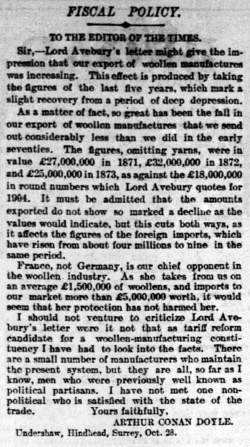 Sir, — Lord Avebury's letter might give the impression that our export of woollen manufactures was increasing. This effect is produced by taking the figures of the last five years, which mark a slight recovery from a period of deep depression. As a matter of fact, so great has been the fall in our export of woollen manufactures that we send out considerably less than we did in the early seventies. The figures, omitting yarns, were in value £27,000,000 in 1871, £32,000,000 in 1872, and £25,000,000 in 1873, as against the £18,000,000 in round numbers which Lord Avebury quotes for 1904. It must be admitted that the amounts exported do not show so marked a decline as the values would indicate, but this cuts both ways, as it affects the figures of the foreign imports, which have risen from about four millions to nine in the same period. France, not Germany, is our chief opponent in the woollen industry. As she takes from us on an overage £1,500,000 of woollens, and imports to our market more than £5,000,000 worth, it would seem that her protection has not harmed her. I should not venture to criticize Lord Avebury's letter were it not that as tariff reform candidate for a woollen-manufacturing constituency I have had to look into the facts. There are a small number of manufacturers who maintain the present system, but they are all, so far as I know, men who were previously well known as political partisans. I have not met one non-political who is satisfied with the state of the trade. Undershaw, Hindhead, Surrey, Oct. 28. This page was last edited on 19 August 2016, at 17:42.